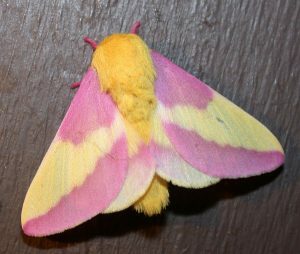 The Rosy Maple Moth is a species of small moths from North America, but is often called the ‘great silk moths’. 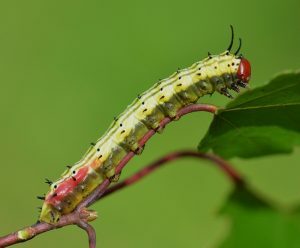 Known for their charming and vibrant looks, the caterpillars of these pink-and-yellow creatures also have a distinct identity with the individual name ‘greenstriped mapleworm’. The moths are also a popular choice in the pet trade. Size: The wingspan length of the male is 1.25 to 1.75 inches, while the female is 1.5 to 2 inches. Body: The entire body (head, thorax, and abdomen) are covered with tiny but dense fur/hair/coat that is orange-yellow in color. The legs are dark pink while the eyes are proportionately large and black. Wings: Both the primary and the secondary wings are soft pink with a dull white to yellowish-cream blotch running through the middle. Sexual Dimorphism: Females are slightly longer than the males, while the antennae in the males are bushier than the females. 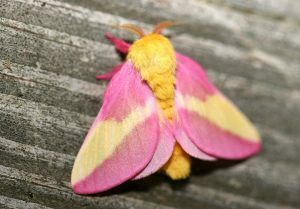 Individual rosy maple moths typically live for about two to nine months. The upper limit comes down to five months in captivity. Rosy maple moths are spread across Nova Scotia west through Quebec to Ontario and Minnesota. They are also found to the south throughout Florida, the Gulf Coast, Dade County, and the eastern parts of Texas. 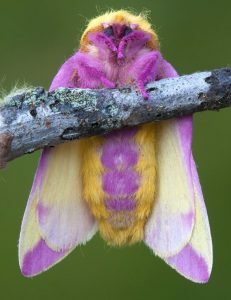 Currently, no regional subspecies of this moth has been defined. They are typically found in the temperate deciduous forests, nearby suburban areas, and urban landscapes. These moths are practically nocturnal creatures and lead a solitary life, except when it comes to mating. Adults undergo a stage of torpidity in the morning and afternoon, after which they come out around late evening for mating. The adult moths generally fly around during the first third of the night. 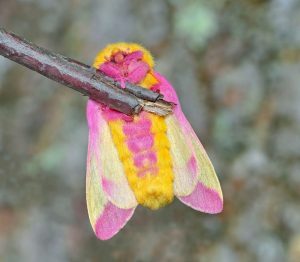 While the larvae consume the leaves of their host trees, the adult rosy maple moths do not feed at all. The moths usually breed one to three times per season. During nighttime, the females give out pheromones for attracting the males. They lay eggs within 24 hours of mating, i.e., the following dusk after mating. 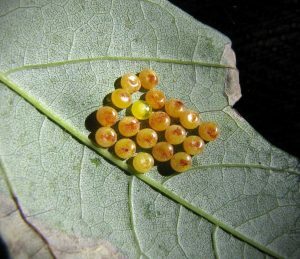 Females lay their eggs on the underside of the leaves of their host tree like the sugar maple. Both the sexes polygamous, choosing a new partner every time they mate. Egg: Between the timespan of hatching and adulthood, these insects undergo several instars. The eggs have an ovular shape with a diameter of about 1.4 mm covered inside a thin yellow shell. It takes about 10 to 14 days for the eggs to hatch. 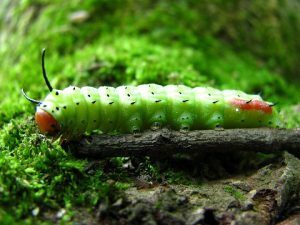 Caterpillar (Chrysalis): This stage lasts for about a month, after which the full-grown chrysalis crawls at the bottom part of its host tree, where they would convert into a pupa in a narrow underground chamber. Caterpillars spend this stage living and feeding in groups until they reach the fourth instar and become solitary. Their host plants/trees usually include oak and maple. Pupa: Much of their time is spent in a pupal stage. The pupa has an elongated shape with tiny spines and is black in color. Adult (Imago): As the insects emerge as an adult moth, they lead a secluded life before they are ready to reproduce. They become sexually active between 2 and 9 months, depending upon the latitudes. Their primary enemies include birds, mostly blue jays, black-capped chickadees, and tufted titmice. The moths have both compound and simple eyes and are able to see ultraviolet rays. Adult moths and caterpillars have tiny hairs known as ‘setae’ that are used for their sense of touch. 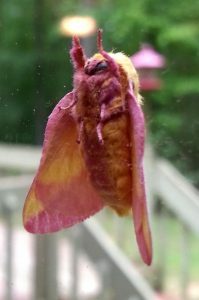 Rosy maple moths cannot hear sounds since they do not have organs needed to hear. The caterpillars can prove to be pests if they are present in clusters on maple or oak trees. The adult moths send warning signals to predators with their bright colors. 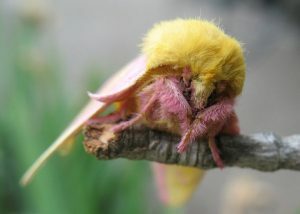 The rosy maple is the smallest of the silk moths.